When it comes to adding artificial light we are truly spoilt for choice, but picking the correct lighting for your bathroom can sometimes be more complicated than it looks. Installing too much lighting can be overbearing, but not enough will leave you fumbling around in the dark. 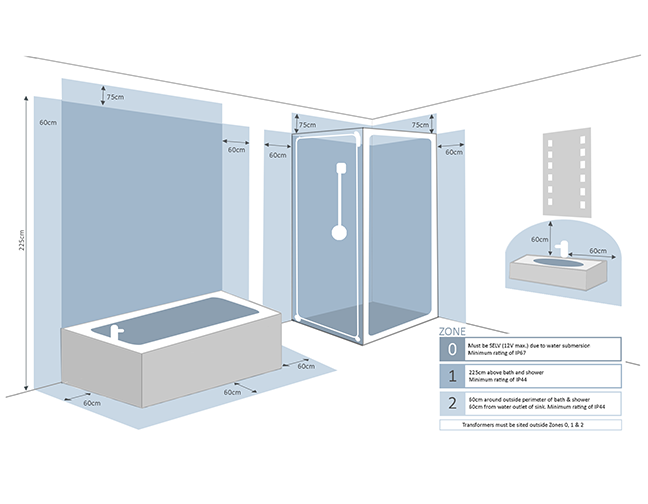 Choosing the correct amount, and style, will ensure your bathroom can be used effectively for daily activities as well as create a calming ambiance when needed. When picking your lighting ensure you have a purpose for each fitting, this will prevent excessive amounts of bathroom lights being installed. From walking into the bathroom to more specific activities, such as shaving or applying make-up, you will need to focus on illuminating the room through Task Lighting. Mood Lighting sets a spa-like ambiance and focuses on more specific areas of the bathroom, for instance alcoves or bathing areas. Finally, Convenience Lighting is installed to help in a certain area of the bathroom, for example, within a cabinet or shelving unit. Once you understand the purpose of your lights, it’s important to choose the correct colour and brightness to best serve your needs. A cool white bulb will project a brighter light which is ideal for task lighting, while a warm white bulb releases a softer light that creates a comfortable and inviting atmosphere. 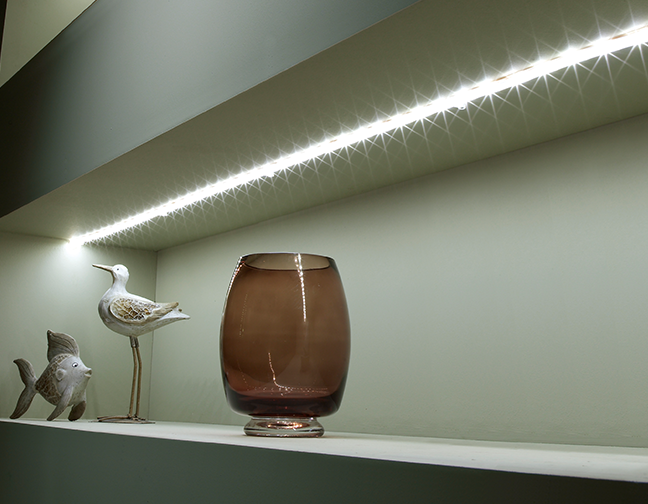 The most important part of choosing your lighting, is understanding where it is safe to utilise within the bathroom. The safety of your fitting is based on an ISO set Ingress Protection (IP) Rating, the higher the IP Rating, the safer the light is when used within a wet environment. A minimum rating of IP44 is required in any bathroom light, and this only goes higher when positioning them in areas around a shower, basin or bath. Once you have chosen the purpose for your lighting, determine a style that complements your overall bathroom theme. The style of ceiling lighting you can use will depend on the shape and size of your bathroom. For example, a single centred ceiling light will work well in a smaller, square shaped bathroom, whereas a longer, more unusual shaped bathroom would benefit with numerous spotlights. The ceiling light needs to be bright enough to use the bathroom throughout the year, but not overbearing and detract from other lighting features. Tip: Use a dimmer switch to operate your main bathroom light so you can change the brightness depending on the time of day. Mirror lighting also falls under the Task Lighting category, this area is well used and needs to be lit effectively so you can apply make-up, wash your face or shave on a daily basis. As well as being well lit, this area needs to be evenly it, adding a light directly above where you stand will cast shadows across your face, instead opt for lighting above, around or included in your mirror. 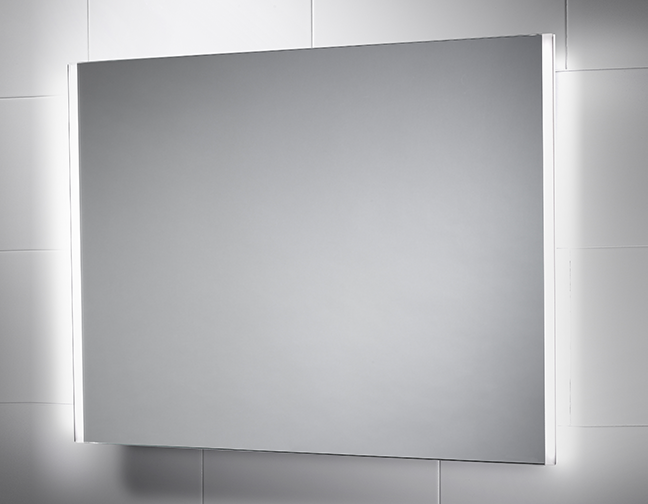 On today’s market, most bathroom mirrors will come with lighting built in. The options are endless, and it is key that you choose a mirror style that will complement your bathroom décor whilst remaining functional. 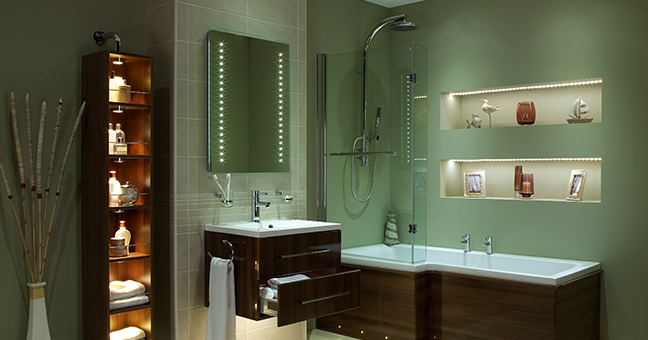 Adding Mood Lighting will help transform your bathroom into a relaxing space. The key to Mood Lighting is choosing a softer, more relaxing level of light that subtly highlights areas of the bathroom. If you have niches or alcoves within your bathroom these can be ideal to light up and create the desired mood, otherwise plinth lighting around your bath will produce the same effect. Alternatively, being a little more creative and highlighting your showering area will create the same, relaxing mood. Placing downlights above the shower, but close to walls, will cast a light that cascades downwards and creates a stunning effect. 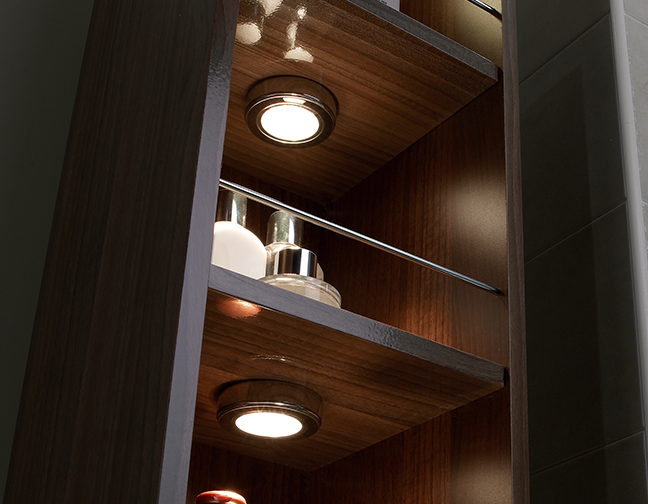 An LED shelf is an alternative way to add convenience lighting to your bathroom. Placing the shelf below a mirror is a useful storage solution for everyday items, but can also be used as a night light to safely use the bathroom without being dazzled.